This interview for me was a must. 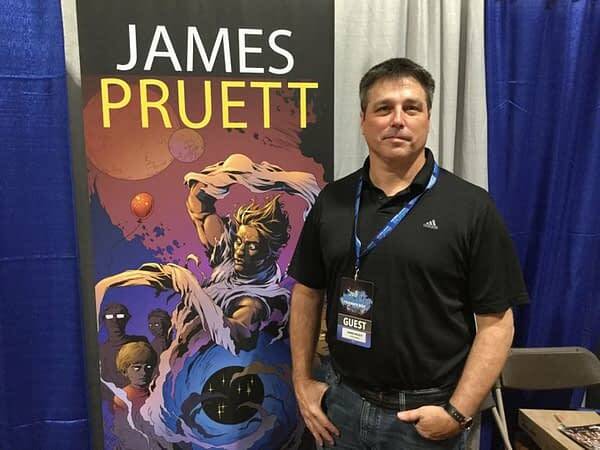 I have been following Scout Comics since their previous incarnation when they were Ardden Entertainment and in the evolution of the company, I think making James Pruett the publisher was a brilliant idea. Especially after I picked his brain a bit on what the future holds for Scout Comics. So, check it out below and let us know what you think. Hope you enjoy reading it as much I enjoyed talking with him. Marco: What as a fan started your love of comic books and how did you get into the industry? James: I started reading comics when I was in first grade Amazing Spider-Man #112, the cover caught my attention when I was in a convenience store and that started my love. I started to go to the store with everything I got from my allowance, I’d buy the first appearance of Ghost Rider, early Fantastic Four, the early seventies are when I started reading comics, I just always loved it, I loved the medium, the art. Of course, most writers in comics are artist wannabees, we just don’t quite have it so it’s ok, I’m going to be a writer and that’s what I thought around Junior High. I used to draw my own comics when I was younger and I have a twin brother, we shared everything so at my age I had a huge library, mostly Marvel back in the seventies, I didn’t start reading DC until the eighties but I’ve always loved the medium, it always talked to me. I like movies, as a writer I knew I wanted to do comics, I’ve written novels and stuff for movies but seeing an artist interpret your work, to me that’s the best experience. It becomes this breath of life, its own entity. As far as how I got into comics, it was around 1991 my twin brother, who I’ll give credit to, he met Bob Burden who does Flaming Carrot Comics, he became his assistant, Bob introduced us to a lot of different people and Joe got published through Caliber in 1992 and we’re very competitive, my motto was if Joe could do this, I could do it better. So I started writing and he introduced me to Garry Reed at Caliber who passed away a few weeks ago and my first series for them was Black Mist and I started doing that with Caliber but before that, Joe and I formed our own little international studio and we had this little community and we used to talk, we had our own t-shirts, so I was thinking one day while working with my dad on a construction job, we should do something that spotlights everything we do, we should do an anthology, each of us do a story and show publishers what we can do. I came up with the idea and Joe and Chuck Moore, they started gathering creators and we did Negative Burn. It was a one-shot series; Joe took it to Caliber and they wanted to publish it but then we made it a monthly so it grew from a one shot to fifty issues. It won awards and so that is basically how I got started in the industry. In September of 1994, I became the managing editor of Caliber till 2000. Marco: If I’m not mistaken it was at NYCC when you were announced as publisher of Scout Comics? James: I was announced September the first but it was more official when I went to New York for the first time, that was the first time I met Brendan Deneen, the CEO of Scout. I was at the Hero’s Con in Charlotte and sought out AC, I was pushing my own book I was writing and we started talking, told him about who I was, what I’d done and I talked about what I thought he could do better with his book, with Scout, we just started talking about how to promote the books better so AC took my thoughts to Brendan, he hooked up us and the next thing you know I’m the publisher of Scout. I thought, this is going to be fun for me, this is going to be a second career for me and it rejuvenated me, I missed it a lot and my day job is a lot more corporate, a lot more restrictive, I miss the creativity of writing and being in comics. My son is seventeen now and he’s into comics and he thinks it’s great so I feel like a big kid again. Marco: Besides what was announced at NYCC by Scout that is coming out in 2017, is there going to be more content we can look forward to? James: There is more coming, I can’t say anything until the contracts are signed but we’ve already got agreements with some people we met in New York. I was looking at the schedule for next year, we’re going to do four to six books a month, I don’t want to do too many comics to start with but I want a book a week but four to five at the most, I want to make sure we can handle that. We’re still a smaller company but we’re growing, we have a good foundation, we have a lot of people behind us now, we have experts in certain areas, I’ve got a history in publishing, Brendan has Hollywood connections, we have another guy who is a TV producer, we have people behind the scenes in multimedia so they can take these properties and build them in different mediums as well but my focus is the publishing side of it. Scout focuses on establishing new talent, that’s what we pride ourselves on, that’s why I enjoyed Caliber. A lot of people started with me, David Mack, my brother, Mike Perkins did my Black Mist series, Michael Gaydos, so that’s what I’m good at, that’s what I want to keep doing, I love finding new talent, new industry stars. Marco: A lot of smaller publishers or mid-size publishers are also doing licensed books as part of their lineups. Is that something Scout might be interested in doing? James: Never say never, we like to create our own properties, that’s what we’re focusing on. I’m not going to say we’re never going to do a licensed title, if the right one came along sure, it would be a great get for us. Marco: As the publisher of Scout, what is it that you want the company to be known for moving into 2017? James: Quality. I want to have fun titles, great reads, entertainment art, I just want to have good quality titles, whatever genre it is. If something deserves to be published, no matter what genre it is, I want to publish it. We have a group of five of us that reviews every submission that comes in, we want something that’s different, something that’s creative and a fun read also. Marco: So, for the audience out there that’s going to be reading this interview why should they check out Scout comics? 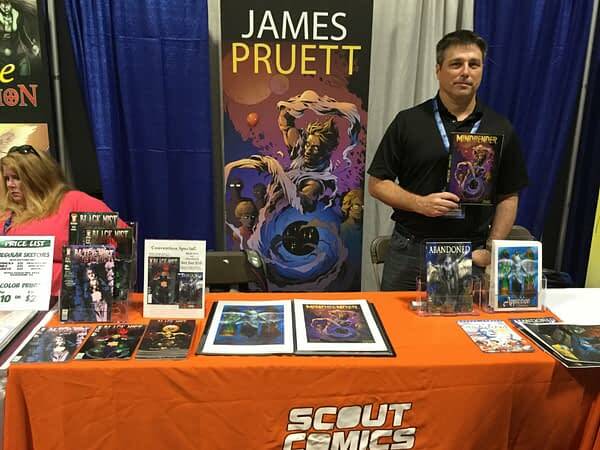 James: If you’re looking for something different, something with quality and with new creators, Scout comics is what you want, it’s what we want to be known for. We have done superhero oriented titles but that’s not our focus but I want you to look at us and say hey, that’s a high-quality book and I’m going to enjoy reading it. I hope you all enjoyed this interview. Don’t forget to let us know how you feel below. Marco Lopez is the co-owner of the website Atomic Rex Entertainment. Where you can find the ongoing weekly webcomic Massively Effective, that Marco describes as Abbott and Costello in tights. Also hosted on the site is Marco’s web strip series Orion’s Belt that follows an Afro-Latino family of adventurers in space and his anthology series A Shot of Whiskey. Marco has also written for Zenescope Entertainment and Lion Forge Comics.